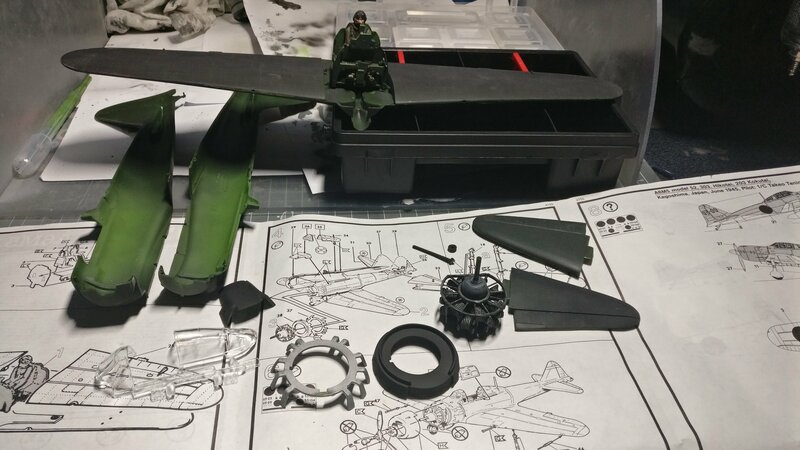 I was proud of my attempt of the engine assembly of my recent FW-190 kit, but I got a couple of nice pointers when presenting it on this blog, and hopefully my attempts at applying those will have payed off. I started off with a black base, and used dry brushed steel color to get a somewhat realistic end result. After that, I assembled everything and did the wash like last time to make it look nice and used. 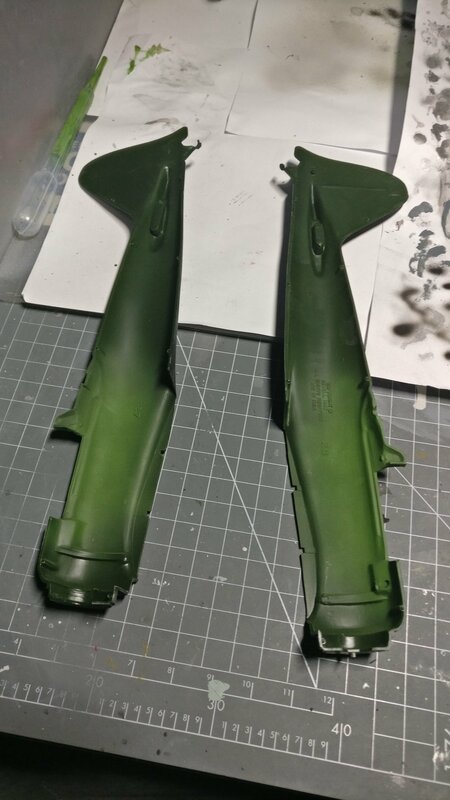 Even though this assembly is a lot more simple than that of the FW-190, I am still at least as happy with the result! Hope you like it! This in itself would probably be a complete page on modern (Revell) kits. The fun thing is it sort of invites you to do your own planning rather than completely go with the manual flow. Of course I still wouldn’t change a thing on the newer instruction booklet. It works for this kit because it is so simple and has relatively few steps. Besides, I am a relatively new builder and with each kit hopefully will step away further and further of the instruction flow. Last week I already applied a layer of primer on the fuselage. Not sure if that was the best choice, but it felt like a good idea to avoid masking tape if I could. Besides, I really went for black basing here, and I can always touch up on the primer if I have to do some more sanding once it is all glued together. Before actually sticking the halves together I did a nice and shadowy layer of farngreen on what will be the cockpit walls. Hopefully this will create some depth, although to be honest I doubt you can see much of the cramped cockpit once it is finished. One point of attention is the rear wheel. This kit gives you no option to attach the wheel later. Once you glue the halves together there is no room to get it in. This means I will either have to do a first layer of the area near the rear wheel, or I will have to do a good job at masking it and maybe use a brush to work near the wheel so I don’t accidentally mess it up. I will probably first do a layer of light gray around the rear wheel area, then stick in the wheel and glue the halves together. After that roughly masking off the area will be sufficient. Last weekend ‘Euro Scale Modeling’ took place in Houten, near Utrecht. It was my first modeling show. I did not take pictures, and I am not sure why not! Too busy looking around I guess. And more regret still: I didn’t have any cash on me. I figured most stands would have the option for electronic payment, but in fact most of them did not. I saw the McLaren MP4/13 I have on my wishlist for 20 euro’s, but I didn’t have the cash to pay for it.. which actually makes me kind of sad now! Ah well, I have enough stuff in my stash to get through the coming year I guess. It is really a beginners book, which is great for me. I am not someone who runs out to try new things, but usually once something or someone plants an idea in my head I start figuring out how I could implement it. A nice thought I got from this book for example: removing raised panel lines and rescribing them. Especially older models (like the Zero I am working on right now) have raised panel lanes, and rescribing them myself would be a great piece of work. I already have in my head on which one of my dads old kits I want to try that on, but I still have a couple of other things I want to do first. Well, that’s all for this week. It is funny all the variations on instruction sheets, I recently got an Airfix kit that was seriously 20 pages long with well over 100 steps. But each step was only attaching one thing! At the other extreme are entire models shown as a single exploded diagram! I guess it does teach us to be flexible. It does! Really goes to show how important it is to first go through the instructions a couple of times to get a good view of what would be a good way to go about the build.